Synchronize a culture of worms by doing a hatchoff: after hypochloriting a population of adult N2 worms to isolate embryos, the embryos are allowed to hatch out as arrested L1s overnight at room temperature in M9. We hypochlorite by adding 0.5 ml of 5% NaHypochlorite (Sigma; Safeway will do) and 0.2 ml of 5 N KOH to 5 ml of worms in distilled water, using a 15 ml plastic conical tube. Once the adults have dissolved, pellet the embryos (at 2000 rpm in a table top Beckman centrifuge: stop the rotor once it reaches 2000 rpm and let brake to a stop), and wash twice by resuspending in M9 and repelleting. The embryos are then transferred to a flask of M9 and put on a rotating platform overnight to hatch. The L1s are then put onto plates with food and allowed to grow up until they are just becoming adults. When worms are just becoming adults, harvest and hypochlorite as above. To speed up hypochloriting, I shake the tube by hand for a minute or so, and then pellet the worms and embryos as above. The pellet is resuspend in water and then add fresh hypochlorite and KOH (check with dissecting scope or eyeball). Resuspending in fresh hypochlorite definitely speeds things up; apparently the first batch is partially neutralized by all the bacterial debris and various forms of worm slime and goo. Add M9 and pellet as above. Resuspend in M9 and pellet again. Resuspend in distilled water and put onto slides (see below). Poly-L-lysine (in solution from Sigma: Cat. # P 8920). We use a capillary tube to draw up solution by capillary action: place the full tip on surface of slide, and allow a small drop to collect. Spread out on slide by using side of tube to spread out evenly over entire slide. Slides should be reasonably clean--fresh out of box or from box opened only to make these coated slides. It's not necessary to acid wash, although that will improve sticking. If slides are clean, solution should spread out evenly without beading up. Avoid getting any small pieces of glass or debris on slide (these will support coverslips and prevent one from adequately squashing embryos: see below). Place coated side up on a preheated hot plate (on a fairly low setting: as long as it is warm when touched with hand). By looking at the slide from an appropriate angle such that light reflects from the coating, you can see when all of the water has evaporated. Remove immediately and place in a slide rack. I keep the end of the slide hanging over edge of hot plate to facilitate picking it up. These slides are good for at least two days, but eventually the embryos will not stick well to them if they sit out (in our experience). I typically prepare fresh slides before hypochloriting worms for embryos. The solution from Sigma goes bad within about six months. We store it at room temp. If frozen, it forms a precipitate. We routinely buy a new bottle every three months to avoid having to figure why our embryos stop sticking to slides. Make up a 5% solution (1.25g in 25 ml PBS is my usual) by adding paraformaldehyde to PBS (standard recipe) and then boiling gently on a hot plate until paraformaldehyde is dissolved. Allow to cool to room temp before using. Make up same day, before hypochloriting worms for embryos. Prepare in hood. All to common a problem is the loss of SKN-1 staining during fixation. The antibody is stable for months at 4 degrees (with 0.05% azide). We tried putting the embryos in water on ice before putting onto chilled slides for fixing, while working at a room temperature dissecting scope. This didn't help. With much diligent practice, one can get 50-80% of slides to fix and stain at detectable levels. We've tried many fixation protocols and still find this the only one that works. After pelleting embryos from hypochlorited worms (see above), suction off the water until you have a reasonably concentrated batch of embryos in 0.5 ml or less of water. Add 30 to 50 µl the resuspended embryos to the middle of slide (poly-lysine side up! I use frosted slides to make it easy to check which side is which). Allow embryos to settle onto slide. They should be crowded but not piling up at all (too many embryos make it difficult to squash them adequately). About 100 to 300 embryos in 50 µl is a good number. If embryos are in M9 or any other salt solution, they won't stick as well, although it isn't essential to have them in water to get them to stick. Once embryos have settled (you can tell if they're sticking because they won't move if you quickly jiggle the slide), add about 150 µl of 5% paraformaldehyde with a pipetteman, coming in from the side (not squirting directly on top of embryos). Remove most liquid (with pipetteman), discard, and add another 150 µl of fixative. I do this three times to ensure embryos are in paraformaldehyde. Embryos will remain stuck; a few will come loose and be lost. Place a 22 x 22 mm cover slip over embryos (see drawing). Brace back corner with finger of one hand and lower cover slip gently with other hand (I use fancy forceps). Try to avoid trapping any air bubbles. 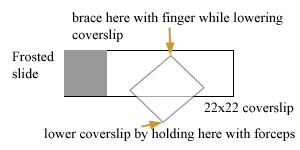 Maintain brace with finger of first hand to keep cover slip from floating off. Wick out excess liquid with a kimwipe while watching embryos in dissecting scope. This sometimes requires kimwipes on both sides (once most liquid is out you can quit bracing with your finger and use both hands to line edges of kimwipes with the edges of the coverslip to maximize the wicking out of the liquid. The embryos should visibly flatten: to get good fixation, it is often necessary to flatten them to the point that some of the older embryos (28-cell stage or so) begin to ooze out blastomeres from their eggshells. When this starts to happen, I stop wicking out liquid and put the slide in a humidity chamber to fix for about 15-30 minutes. I typically set up 4 to 5 slides consecutively, placing them together in the humidity chamber as I finish each one. If the fixation is good, the embryos will almost immediately become very white instead of the yolky-yellow/brown color they are before squashing. If they remain yellow/brown, they probably won't stain, although you can't count on the staining working just because they turn whitish. It usually takes quite a bit of practice to get good at this, and even then I'm usually successful in getting staining with only about 60-80% of the slides I prepare in which the embryos turn whitish (I toss out slides in which I don't get good squashing to the point of having the embryos turn whitish). This squashing is a crucial step. Good squashing => 100% embryos stain with SKN-1 antibodies. But such a slide can be rare unless one is routinely doing this. It is also possible to get staining by cutting open worms on slides in PBS or water, and then replacing the water with paraformaldehyde/PBS, and squashing. The carcasses help prevent complete crushing of the relatively small number of embryos. I usually do about 5-10 worms/slide. More than that, and the embryos seem to not stick as well as you cut open more worms. Remove slide from Tris Tween (or PBS) and use a kimwipe to dry off bottom and top, leaving a moist film covering the embryos. You can pre-block if you wish (we use 1% BSA in PBS), but in general for MAb's in medium with serum, and for dilutions of rabbit or mice serum in 1% BSA/PBS, we don't bother. But when we do, we block for 30 minutes at room temp. Remove the BSA by wiping with a kimwipe until a thin film of moisture remains, and add antibody (we typically use 20-25 µl of whatever dilution). Incubate in a humidity chamber for 1 hour at room temp (or overnight at 4°C if you prefer). If you dry the slide off everywhere but where the antibody drop is, and keep the humidity chamber on a level surface, the antibody drop will remain over the embryos. Alternatively, one can gently lower an 18x18mm cover slip on top of the embryos, and then use a squirt bottle of Tris Tween and squirt gently around edges of coverslip to help loosen it and float it off when you are ready to wash. Place the slide in Tris Tween (we use Coplin jars). Wash three times for 4 minutes each. Again, wipe off excess moisture around embryos, and add secondary Ab (we like Tago antibodies very much, FITC or rhodamine conjugated). Incubate in humidity chamber at room temp for one hour. I typically use 1/100 dilutions (in 1%BSA in PBS) with 50 µl drops on the slide, and we don't use a cover slip since getting cover slip off usually causes more loss of embryos each time). I find almost all antibodies that are going to stain do so within a half hour at room temp, and do one hour for peace of mind. I often do overnight at 4°C for primary antibody; 37°C works fine if that makes you feel better. Wash secondary as before, except after last wash go into PBS with DAPI (we add 1 µl of 1 mg/ml DAPI to a Coplin jar (about 50 ml of PBS) and then into PBS without DAPI for 1 minute. Remove slide, use kimwipe to wipe off excess liquid, put on a 22 x 22 coverslip, wick out excess liquid (thoroughly), add mounting medium, and seal with fingernail polish. Here's the procedure I use and it works beautifully for me. Embryos are squashed in 4% paraform. buffered with 60mM pipes pH 6.8; 25mM hepes, pH 6.9; 10mM EGTA; 2mM MgCl2 the slides are kept at room temp for 5 minutes to fix, then frozen on dry ice, the coverslip cracked off and the slide is placed in -20°C solution of DMF for 3 minutes. Then the slide is washed in PBS, 3X and blocked with 10% goat serum for 30 minutes. Extra fluid in drained off (but slide is not washed) and anti-SKN-1 serum is added and incubated at 4°C for over night-the rest you know. Part of the reason I see such good SKN-1 staining could be due to the secondary I use. It's from Jackson lab;it's Cy3-conjugated anti-mouse IgG. The lot number I have is 42729 and it is NOT specific to IgGs. I've tried others and it is by far the best.